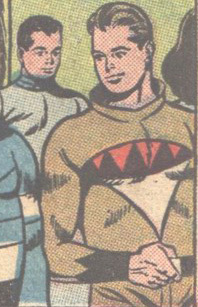 Part three in our series of tributes to the common and/or crappy superteen of the future is devoted to the poor shmoes who had their Mom (or their Mom's robot, at least) sew up a costume and drive them down to Legion HQ but weren't quite distinctive enough to merit their own tale of rejection. Now most of the fine folks pictured here appeared in the same issue as Lester Spiffany and Stormboy (Adventure Comics 301, if you must know) and were a little overshadowed by those two notable gentlemen. In the interest of fairness, here's a who's who of the world of superhuman crowd scenes, presented in the order in which they appeared, with on-the-spot reviews. To the Lavender Target's right, in the green/brown shirt and red/brown pants, is Ask-Me How -I-Recently-Lost-Over-65-Pounds Lad, who was trying to join the Legion in order to promote his diet/exercise book, I'll Tell You How I Lost Over 65 Pounds, Lads. Rejected by the Legion of Superheroes, the Legion of Substitute Heroes, the Wanderers and the Khunds, he regained the weight and found unexpected happiness as a Bouncing Boy impersonator. Here we have The Bouffant, heroine of Anzac III. A mutant, she was born with a super-tough shell of hair, sufficiently hard to crack plate steel and so dense that nothing could penetrate it, rendering her immune to even the most powerful telepathic abilities. 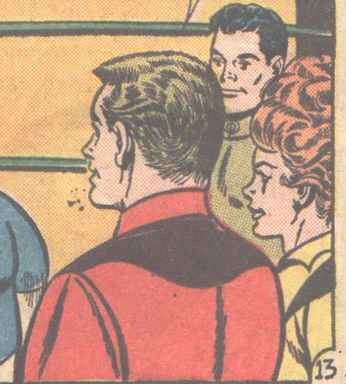 She too almost made it into the Legion, but was forced to leave after breaking Colossal Boy's nose for calling her "a real firecracker," and offering to help her adjust the complimentary flight belt. Pictured behind her is You'd Look Great in Powder Blue Kid, who was forcibly removed from the area soon thereafter for using his powers a bit too freely on the other applicants. Note the poor shmuck in the background of this frame - clearly reveling in his brand-new powder blue jumpsuit. The other guy's name was Biting Brad, who had a formidably fanged maw, as his chest emblem suggests. 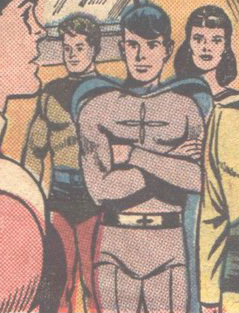 Brad is virtually unknown, but was the first applicant to demonstrate the rule that states that anyone whose superheroic name is just their real name with a little bit extra (Porcupine Pete, Radiation Roy, Eye-ful Ethel) will never ever get into the Legion. Biting Brad later became the first person to die of scurvy in almost eight hundred years. Another shot of The Bouffant, who is a bit of a firecracker, at that. Note the two guys in the background of this picture - You'd Look Great In Powder Blue Kid has struck again. The Kid later attempted to become a super villain, but his plots only ever really succeeded in boosting the economies of regions that produced blue dyes. The Lavender Target, who's feeling a bit more comfortable now. Though he was able to eat bullets and shoot them out of his eyes, the Target was rejected by the Legion after he nearly throttled himself when his flared cape got caught on a door knob. The young man on the left of the second panel is Chet Kord, thirtieth century descendant of the Blue Beetle. Unfortunately, Chet doesn't just use devices instead of innate powers, he uses the same devices that his ancestor did, one thousand years earlier. Not only is he rejected , he is laughed out of the building, and Superboy vows not to believe his umpteen-times great grandfather if he attempts to tell him about any grand conspiracies back in the twenty-first century. The other lad is The Spelunker, who goes to the bathroom a few minutes after this and is not seen again until years later when the Legion of Substitue Heroes take over the Legion clubhouse. During renovations, Color Kid finds a green-clad skeleton in a particularly twisty bit of ducting and has to go lie down for a while. More on these two in a minute. 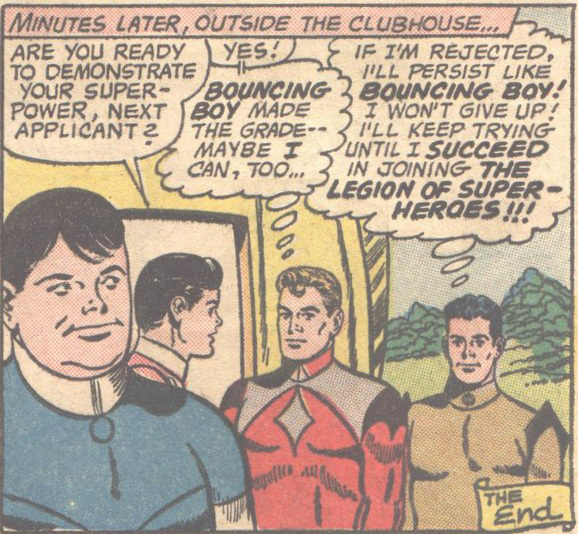 Let me just take a second to explain that a) Bouncing Boy has just explained to these youngsters exactly how the hell he got into the Legion and b) yes, that is The Bouffant. It was just a bit chilly and she put on a jacket. So: The lad in the red and grey is Reg Winthrop, Two-Fisted Seismologist. Reg hoped to get in based on his Metropolis University boxing championship and his ability to guess the severity of an earthquake to within one point on the Richtor Scale, but was swiftly rejected - especially after he tried to prove his might by decking Shrinking Violet. On the right is Gastrointestinal Discomfort Boy, who followed through on the vow that he makes in this panel. When his power of inflicting painful abdominal cramps on others was deemed unsatisfactory and he was rejected from the Legion, he refused to give up hope and showed up at every subsequent tryout they had. Once he started hanging around outside Matter-Eater Lad's door for hours at a time, the Legionnaires were forced to take out a restraining order. GD Boy can still be found lurking at the edges of the three hundred metre limit imposed by the courts, staring hungrily at Legion HQ. Well, that's that - those are the people that failed the most.